(12:30 p.m. EST) -- I'm live from Fred. 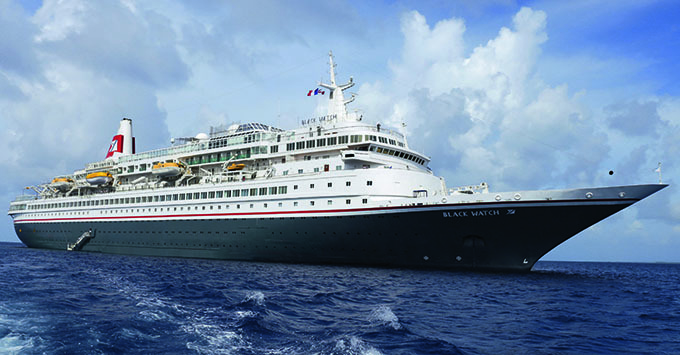 Olsen Cruise Lines' 804-passenger Black Watch, as it sails on its 108-night world cruise round-trip from Southampton via some of the most beautiful spots on earth. We're currently sailing the stunning South Pacific Ocean, heading for Auckland, New Zealand. 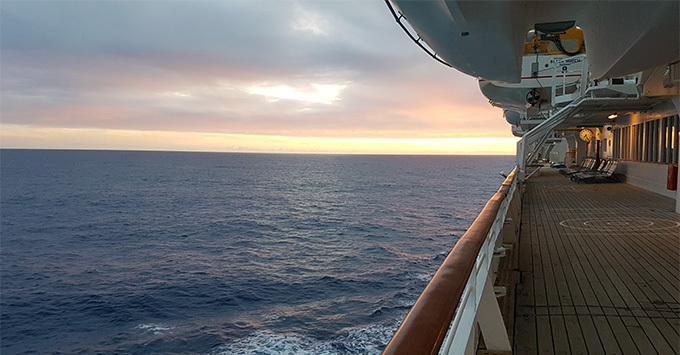 I've been onboard for almost two months and I've noticed how easy it is to fall into routines and habits on a World Cruise, as well as learning who and what is probably best avoided. Here are some of my observations. I have managed to pick up the worst possible habit and that's visiting the buffet for late night snacks. I know I shouldn't, but the food after 11 p.m. is incredibly good - I wish there was more of it on offer at lunchtime. I have a much lighter evening meal now than I did at the beginning of the cruise and it's because I look forward to a slice of pizza or piece of fried chicken later in the evening. I try not to do it every night, but it is becoming part of my daily routine and I'd be lying if I said I had any intention of stopping. I've also changed my breakfast routine in the last few weeks -- I either skip it completely or force myself to only have cereals -- it's too easy to have things like bacon, eggs and hash browns every day! Being on a ship this long means that you inevitably will meet people and create new friendships, but it doesn't always work out for the best. What has been very interesting is to observe how the dynamics between some people have changed. There are one or two passengers that I tend not to engage with now, whereas at the beginning of the cruise we would sit and chat. It's not because we fell out, but you start to see things and learn more about people and sometimes, the best thing to do is distance yourself. Anyone that has been on a long cruise will know that gossip spreads around a ship like wildfire and I prefer to keep away from those that tend to feel the need to discuss everyone's business while managing to never disclose their own. At this time in life, it's something we can probably all do without hearing. It's also been interesting to see the different relationships between other people, some have flourished and blossomed into beautiful friendships, while others have literally crashed and burned. Oh, life at sea. It's certainly never boring. My worries that entertainment could have become dull (especially on such a small ship), have been unfounded as there's so much variation -- and guest entertainers come onboard in almost every other port. Having said that, the novelty of the evening show filled with singing and dancing has worn off for some people -- those that used to visit the theatre every evening might only go two or three times a week now. The shows that always get the best reaction are those put on by local people. Having called this ship home for the last two months and with another 9 weeks to go, of course there are other little things that I have changed since the beginning of the cruise, to fit the rhythm of onboard life. If the fruit bowl suddenly reappears in the Brigadoon (buffet restaurant), for example, I'll take a few pieces of fruit to the cabin before stocks start to diminish. If the quiz or bingo is on in the Lido Lounge, I will not go in and order a drink, I'll find a waiter on the open decks. A lot of the habits and routines I have picked up are relatively small, but sometimes the smallest things can make the biggest difference. All I'd like now is for the sun to come back, so we can once again enjoy the beautiful open decks of this wonderful ship as we head for Australia and New Zealand and then Asia and onto the Mediterranean and home.